Only two hours away by a long-distance bus, Buyeo is a perfect place for a short trip from Seoul. 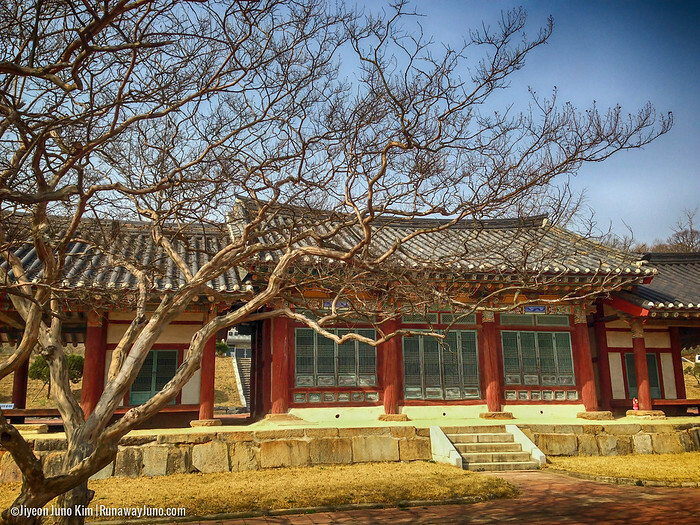 Although Buyeo is a small town, but it is an important location for Korea’s history. Buyeo was Baekje’s capital, 538-660 AD, during which it was called Sabi Fortress. Baekje (18 BC– 660 AD) was a kingdom located in southwest Korea. It was one of the Three Kingdoms of Korea, together with Goguryeo and Silla. Baekje people’s craftsmanship created many crucial national treasures. 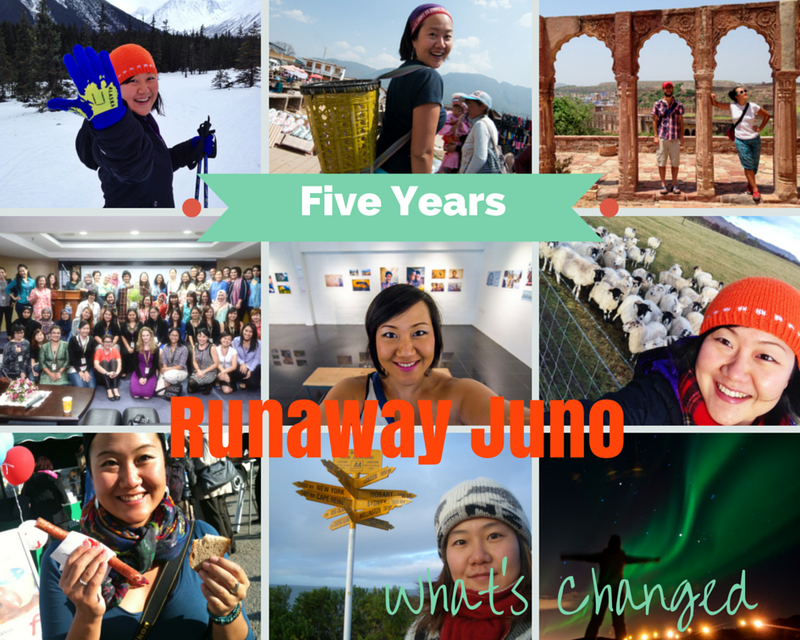 Here are the big five highlights of Buyeo. This 64 centimeter tall bronze incense burner is one of the most significant symbols of Baekje’s artistry and Korean art. “The Burner embraces the mind of the Baekje people who delicately chased their ideal world with exquisite techniques and high appreciative eyes. The Incense Burner of this kind has not been found anywhere in the world since then. It is no wonder that it can be really called a masterpiece”, according to the Culture and Tourism website published by Chungcheongnam-do. 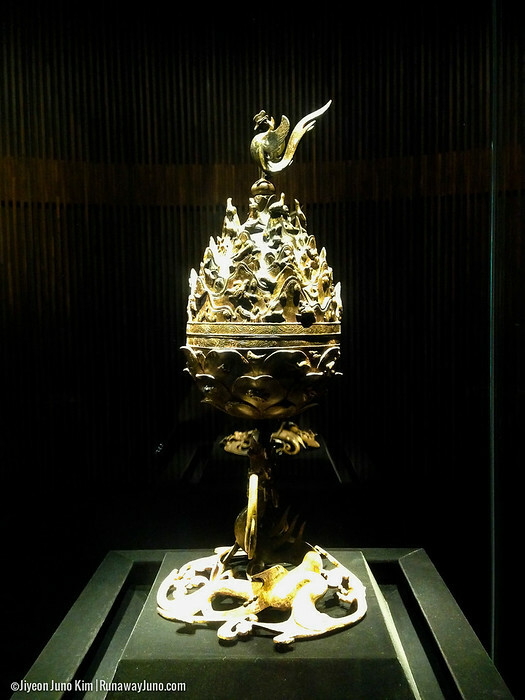 The incense burner can be classified in four parts: the body, lid, the phoenix-shaped knob, and the support plate. It uses realism and is three-dimensional. The incense burner incorporates Buddhist and Taoist themes but some theorize that the burner symbolizes themes of Northeast Asian culture. The dragon and phoenix suggest a yin and yang motif. However, the uniqueness of the artifact suggests that the burner may have been used for ancestral rites or other unique ceremonies. It looks like just a well-crafted structure at first, but every ins and outs of this burner is amazingly crafty, and contains a lot more than we can understand. The top of the lid is capped with a bonghwang (phoenix) which holds a magic pearl. The lid is encircled by 74 mountains thinly cast in five layers reaching the top. The lid also contains various figures cast in relief including five musicians with different musical instruments, sixteen other figures, and thirty-nine animals including mythical creatures, tigers, dragons, and deer. The lid also has different kinds of scenery including six types of trees, boulders, trails, waterfalls, and lakes which may symbolize the ideal landscape of a Taoist hermit. Five birds sit at the top of the five highest peaks of the mountain, and the top of the lid is crowned with a dragon. The body of the burner is shaped in the form of a blossoming lotus. The petals of the lotus also contain twenty-six animals on the lateral surface including fish with wings, heavenly beasts, and birds. The support plate is in the shape of a dragon with its mouth facing the base of the body which it supports. The dragon is surrounded by a blowing bronze motif of clouds, and its own tail is arched, giving the base a sense of movement. It’s located in National Museum of Buyeo. 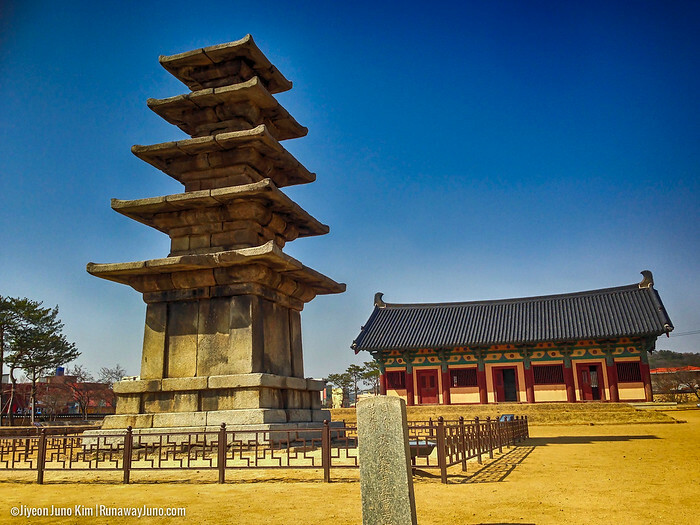 The five stories stone pagoda of Jeongnimsa Temple Site is a five-story pagoda standing on a single narrow and low base pedestal, that was built in Baekje era (6-7th century). The Jeongnimsa temple was not only the hub of temples in Sabi (Buyeo’s ancient name), but also the center of the town geographically which was surrounded by outer walls. None of the temple structure can be seen except the excavation site and this handsome stone pagoda. Specialist craftsmen of Baekje chose stones in order to pass the limitation of wooden pagoda. In the early stage, stone pagodas just imitated the structure of a wooden pagoda but they gradually became smaller and simpler. This stone pagoda looks elegant due to its refined formative beauty. Though the pagoda faithfully follows the formation of wooden buildings with a single narrow and low pedestal, thin and wide and raised roof stones, but it is not just an imitation, rather it is a refined and creative work. It was built by a well-calculated structural ratio. The pagoda is highly valued as an origin style of stone pagodas in Korea, and also highly valued as one of the two last remaining stone pagodas from the Baekje Era. A stone Buddha is looking directly at the five stories pagoda at Jeongnimsa temple site. Jeongnimsa temple was built in the 6th century and continued working as a temple during the Goryeo Kingdom (918-1392 AD), and this stone Buddha is believed to be built in Goryeo era. It’s worn out over the time, but by the remaining structure, we can guess that it is Vairocana Buddha. Korea’s first artificial lake, Gungnamji offers four different sceneries in each season. 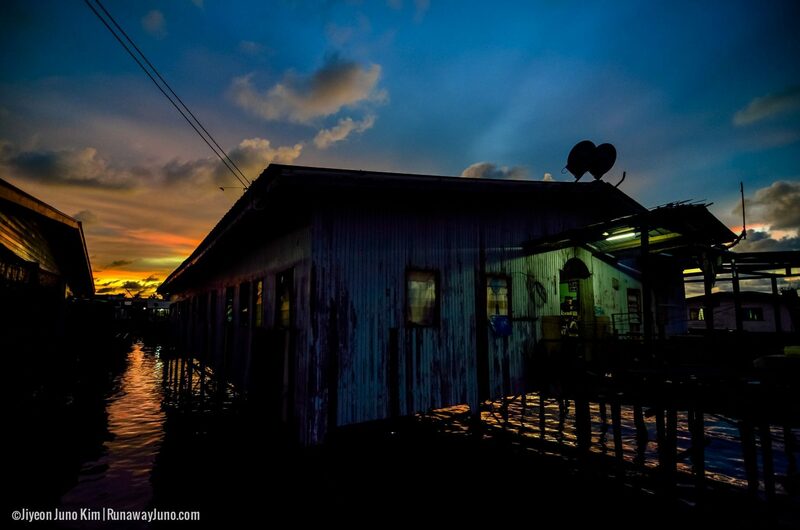 The most famous scene is in summer, when all the lotus flowers bloom in the entire region. It’s considered one of the best sights to see in Korean summer. It was called Gungnamji based on the phrase that the pond was built in the south of palace on Kim Bu-sik’s book, Samguksagi (History of the Three Kingdoms). 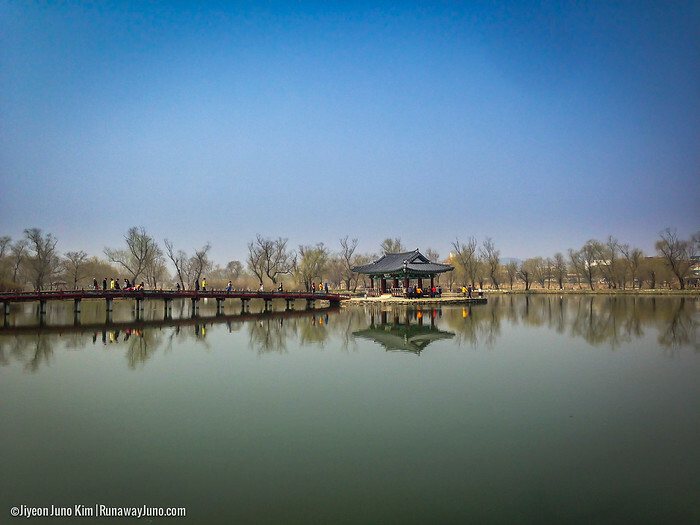 According to that book, the water brought through the 8-kilometer waterway to plant the cherry trees, while the island in the middle of the pond symbolized Bangjang Burial Mound. However, we can only guess the shape of the waterway and island by some of the artifacts. In the east side of the pond, a palace building site was found. Gungnamji, imitated the pond, was call the Sinseon Garden, which means where people prayed for eternal youth and longevity. Around the pond, a wall and a foundation stone still remained, while the main hall and wooden bridge remained in the pond. It was the first skill of Baekje that the large pond like a sea located near the palace and this gardening skill influenced Unified Silla and Japan. A small hill called Busosan in the north is looking down on small, but historically important town of Buyeo. Busosansung(Buso Mountain Fortress), on the top of Busosan was built in 500-538AD to protect the capital of Baekje Kingdom. Some parts of the fortress were reconstructed during the Unified Silla Kingdom (676-935 AD) and modified again in the Goryeo (918-1392AD) and Joseon (1392-1910AD) eras. Busosan was considered the guardian mountain of Buyeo and is a home to historic landmarks from this era. 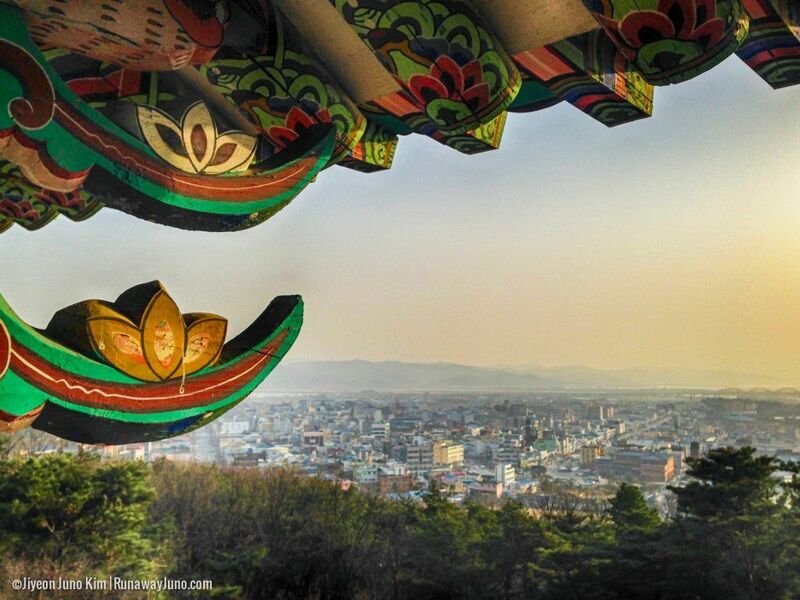 In addition to Busosanseong Fortress, some of the most famous sites on the mountain include Baekhwajeong Pavilion, Sajaru Pavilion, Banwollu Pavilion, Yeongillu Pavilion, Samchungsa Shrine (dedicated to three loyal subjects of the Baekje Kingdom), Gungnyeosa Shrine, Goransa Temple, Gunchangji (military warehouse site), Suhyeoljugeoji (site of pit houses for the Baekje soldiers), and Nakhwaam. Nakhwaam is a rock cliff towering over Baengmagang River in the northern end of Busosan Mountain. According to the legend, this is where the royal court women of Baekje jumped off to kill themselves when the kingdom of Baekje was defeated during the invasion of Sabiseong Fortress (now Busosanseong Fortress in Buyeo) by the Shilla-Tang Alliance (641-660 AD). The name of this rock, Nakhwaam, literally means “the cliff of falling flowers” and symbolizes the fidelity and loyalty of Baekje women. 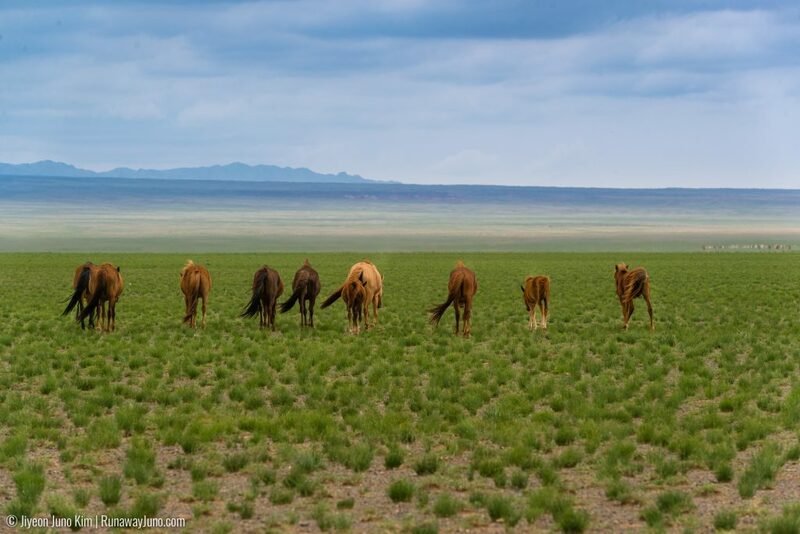 For more information about Buyeo, visit their website. This all looks so exotic and so interesting. I wish I could visit Korea one day. Interesting history…. but don’t think I will be seeing this on my trip to Seoul this Friday. 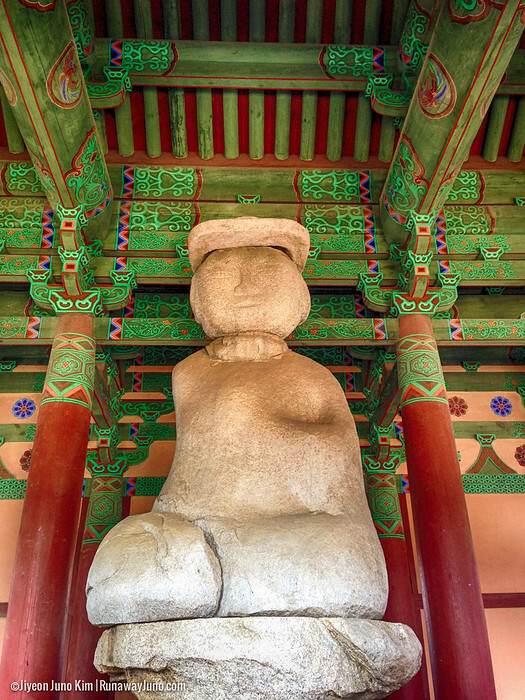 Lots of amazing treasures in Korea … more people need to get out and discover them!